OUR GRAZING TABLES ARE THE PERFECT WAY TO MAKE A STATEMENT AT YOUR NEXT EVENT, WHETHER IT'S AN INTIMATE GATHERING, LARGER SHINDIG, BRAND LAUNCH, PRESS DAY OR EVEN A SPECIAL GIRLS NIGHT IN. GRAPE & FIG CURATE AND DESIGN EACH TABLE PERFECTLY TO SUIT YOUR NEEDS. ENJOYED DURING LUNCH OR DINNER, THEY MAKE LIFE EASY, BRING PEOPLE TOGETHER AND CREATE CONVERSATION AND LASTING MEMORIes. take a look at our ‘lookbook’ menu further down this page to NAIL your PERFECT grazing table AESTHETIC. SPECIALITY cheeseS, cured meats, antipasti, dips, falafel, sweet pakora, locally baked bread, crackers, chutney, dried nuts, dried fruit, seasonal fruit and VEGETABLES AND SOME sweet treats. (IF THERE IS SOMETHING SPECIFICALLY YOU WISH TO SEE, OR WANT US TO AVOID, WE CAN WORK TOGETHER TO ENSURE IT'S JUST RIGHT). want to ‘bulk up’ your graze? 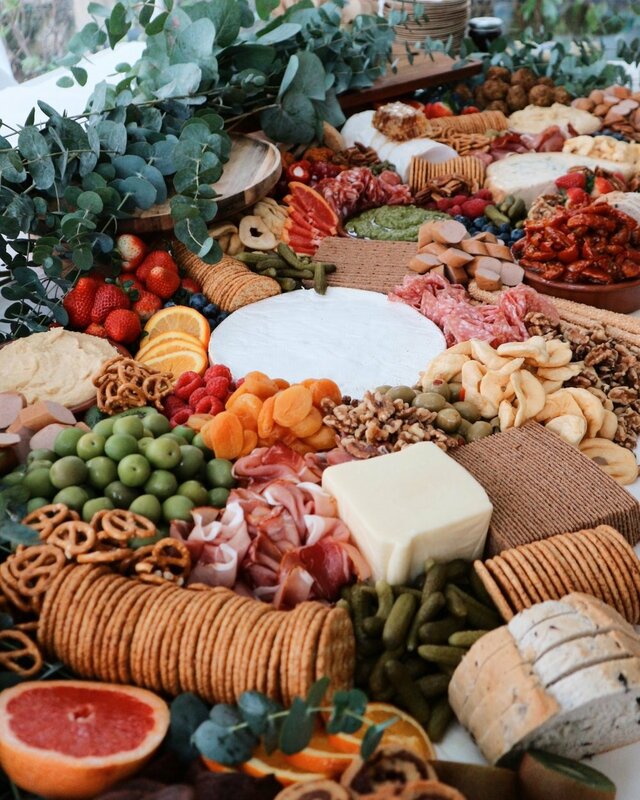 look no further than our fun bagel bar with all the deconstructed INGREDIENTS your guests need to build their perfect bagel. HAVING A GRAZING TABLE AS YOUR ‘MAIN MEAL’ FOR YOUR WEDDING? OR SIMPLY WANT TO ENSURE THERE’S PLENTY FOR EVERYONE? WANT TO ‘BULK UP’ THE STANDARD GRAZE? THEN WHY NOT ADD SOME GORGEOUS, FRESHLY MADE SALADS TO THE MENU. ‘‘Straight from the beehive, this is a delicious treat: pure honey in its most natural state. From honeybees on the Dorset coast, the honey is characterised by Hawthorn nectar. OUR BRUNCH GRAZING TABLES ARE THE PERFECT WAY TO MAKE A STATEMENT AT YOUR NEXT EVENT, WHETHER IT'S AN TEAM BUILDING DAY, CORPORATE MEETING, BRAND LAUNCH, PRESS DAY OR EVEN THE MORNING OF YOUR WEDDING. OUR BREAKFAST BOWL GRAZING BAR IS THE PERFECT WAY TO MAKE SURE THE FIRST MEAL OF THE DAY IS MEMORABLE FOR YOUR GUESTS AND/OR CLIENTS. SUSTAINABLE AND REUSABLE POLISHED COCONUT BOWLS ARE PROVIDED TO BE FILLED WITH BREAKFAST GOODNESS FROM THE ‘DIY’ BAR. OUR DESSERT GRAZING TABLES BRING TOGETHER ALL OF THE BEST CAKES, PUDDINGS, TARTS AND SWEET TREATS IN A BEAUTIFUL STYLISED DISPLAY- PERFECT TO ENJOY AT A WEDDING, OR FOR A 'PUDDING PARTY'. WE WORK WITH YOU AND OUR BAKER TO CREATE THE PERFECT MENU FOR YOUR EVENT. FRESHLY CUT FRUIT AND VEGETABLES, DIPS, CRACKERS, POPCORN AND SWEET TREATS. at grape & fig we have curated a number of different signature and iconic ‘looks’ (applicable for all food-type and length of grazing tables) which our customers can choose from depending on personal taste, STYLE and AESTHETIC, the ENVIRONMENT the graze will be in, or the event theme and/or budget. the menu will not change, but the VOLUME AND TYPE OF TABLESCAPE EQUIPMENT/SERVEWEAR and foliage/blooms used to ‘dress’ the table will. MINIMALIST, deconstructed grazing elements styled on marble slabs at DIFFERENT HEIGHTS AND DEPTHS TO CREATE INTRIGUE AND A TRULY ‘WOW’ EFFECT. screams pure DECADENCE and luxury. super, SUPER INSTAGRAM-ABLE. PERFECT FOR HIGH-END BRANDS WHO WANT TO IMPRESS. (TOP TIP) THE ‘CHOCOLATE BARK BAR’ WORKS PERFECTLY WITH THIS LOOK. MARBLE AND WHITE TILES STACKED ON GOLD BASKETS, WITH GLASS BOWLS AND CONTAINERS. LUXE MARBLE AND GOLD CHEESE KNIVES. PERSONALISED printed MENU is INCLUDED AS STANDARD. orchids, green AMARANThs and fern. luxe elements surrounded by a vast landscape of grazing goodness. ESSENTIALLY this ‘look’ is the ‘no-fuss lay flat’ with some HEIGHT AND DEPTH added by tablescape EQUIPMENT in areas, TO CREATE INTRIGUE AND A TRULY ‘WOW’ EFFECT. PERFECT FOR those who want their graze to have an element of the ‘super-luxe’, but have a SMALLER budget. (TOP TIP) THE ‘bagel bar’ works perfectly with this look. BOHEMIAN, EARTHY, rustic and NATURAL TONES. PERFECT FOR wholesome brands or outdoor weddings which require a rustic look. (TOP TIP) THE ‘PURE HONEY, ISLE OF PURBECK HONEYCOMB FRAME’ WORKS PERFECTLY WITH THIS LOOK. WOODEN stacking equipment and boards, CLAY POTS AND BOWLS, WOODEN CHEESE KNIVES. NEED AN ALL-PINK GRAZE DISPLAY? fancy A CUSTOM PAMPAS GRASS HANGING INSTALLATION ABOVE YOUR GRAZE? WANT YOUR WEDDING FLOWERS TO MATCH THE floral DISPLAY ON THE GRAZING TABLE EXACTLY? like the idea of an italian-inspired grazing table? …whatever the request, grape & fig are here to make it happen. PERFECT FOR PRODUCT LAUNCHES, store-openings, brand awareness events. (TOP TIP) ensure you send us a full BRIEF oN the event so we can get the creative juices flowing as soon as possible! tell us your vision and we will style accordingly. exactly what it says on the tin- a no-fuss lay flat grazing table. 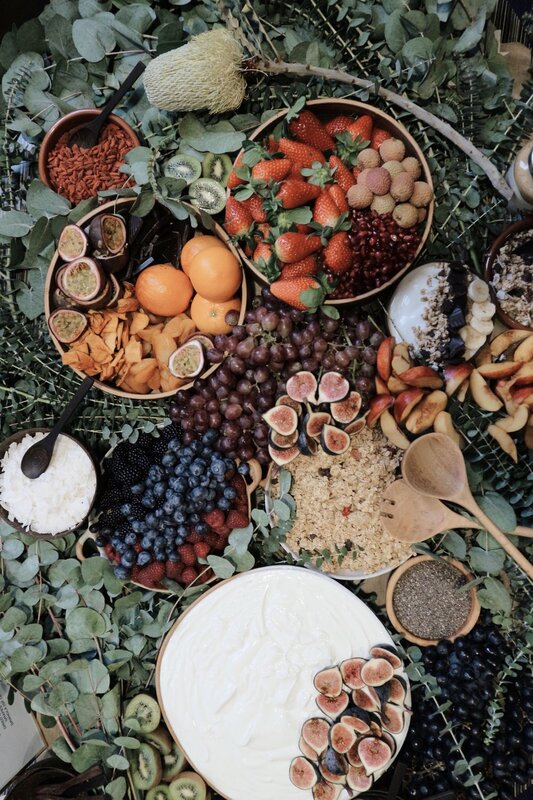 it’s casual dining at its finest; rich arrays of savoury, sweet, soft fresh fruit, crunchy crackers, creamy cheeses and salty antipasti form a vast landscape. PERFECT FOR laid-back weddings and gatherings. (TOP TIP) perfect for customers who don’t want to pay for collection of tablescape EQUIPMENT post-event. NOT PROVIDED SO CUSTOMER WILL HAVE TO PROVIDE RAMEKINS, CHEESE KNIVES AND tongs.